There can’t be many Christmas trees in the UK decorated with hippos – but there is one now in Maidenhead thanks to Family Friends. Inspired by our logo and our mascot Freda, a wonderful team of festive volunteers (pictured above) hung more than 70 hippopotamus heads on a tree at St Luke’s Church in Norfolk Road, Maidenhead today (7 December). The decorations, made of wool and in yellow and blue, were created by new volunteer Cecile Ruiz-Cielo-Henderson, who used her crochet skills. Fellow volunteers Toni and Marianne, Katherine Cooke, our volunteer coordinator, and parent Claudia and three youngsters, got together this morning to set up the tree. The Family Friends tree is one of about 80 that have been adorned with lights and baubles for the seventh annual Christmas Tree festival, which takes place from Friday 8th to Sunday 10th December. 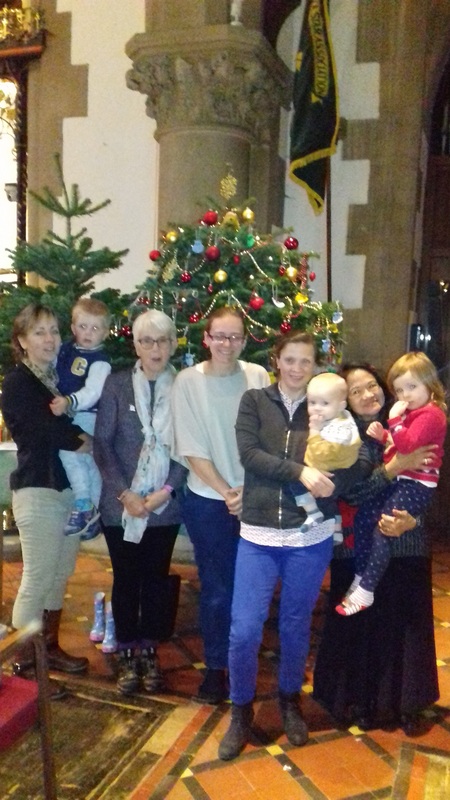 Local businesses, voluntary groups and churches, as well as families and charities will are sponsoring and decorating a tree to a theme of their own choice. Visitors to the festival will be invited to vote for their favourite tree by putting money in a pot. All the money raised from voting will go to the PLANETS, a charity based at Southampton General Hospital, dedicated to defeating Pancreas Liver And NeuroEndocrine Tumours (NETs), with other funds raised during the festival weekend being used for the work of St. Luke’s Church.